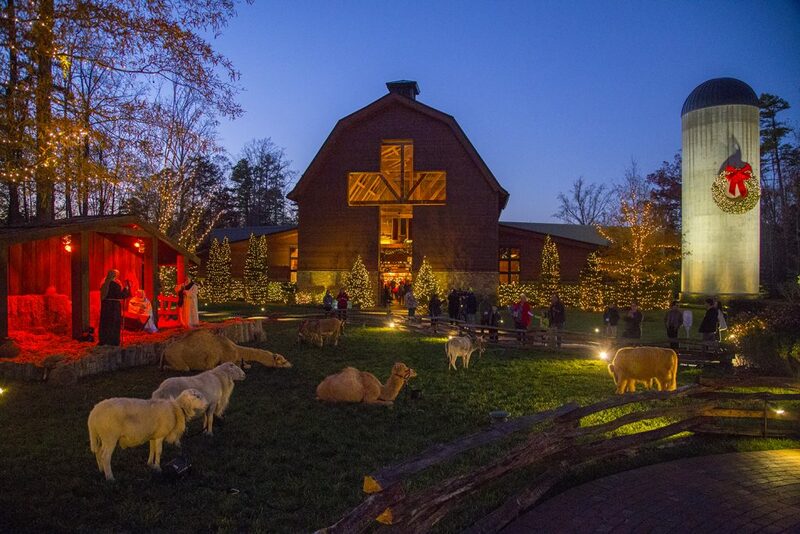 CHARLOTTE, N.C., Nov. 26, 2018—Christmas at the Library has become an annual tradition for many, with more than 385,000 celebrating this wonderful season at the Billy Graham Library since its opening in 2007. Thousands of visitors are anticipated this year for the 11th annual Christmas at the Library, which runs Nov. 29-Dec. 22. Christmas at the Library—which kicks-off a few days earlier this year—welcomes people from across the Southeast and the U.S. to experience the retelling of the birth of Jesus Christ, complete with a live Nativity depicting the very first Christmas night. Guests can also enjoy holiday favorites including horse-drawn carriage rides; Christmas story time for children; live music from carolers; a beautiful light display; a large, ornamented Christmas tree; holiday shopping and more. Carriage rides are $8 per adult and $4 per child under 12. Christmas dinner, served at the Billy Graham Evangelistic Association headquarters building adjacent to the Library grounds, is available Thursday through Saturday each week at 5 and 7 p.m. This traditional holiday meal features turkey and carved ham with maple Dijon glaze, cranberry cornbread stuffing, other savory dishes and an assortment of festive desserts. Space is limited and prepaid advance reservations are required. Dinner is $22.95 per adult and $9.95 per child aged 4-12. No charge for children 3 years and under. Make your reservation. The Library’s operating hours during Christmas at the Library are Monday through Thursday, 9:30 a.m. to 9 p.m., and Friday and Saturday, 9:30 a.m. to 10 p.m. The Library is closed on Sundays. Monday—photo with a camel from 5-7 p.m.
Tuesday—painting on the patio for adults from 2-4 p.m.
Wednesday—Christmas crafts for children from 2-4 p.m.
Mondays-Saturdays—guests can interact with animals from the live Nativity from noon to 2 p.m. each day. Animals include camels, goats, sheep, a donkey, a Holstein cow, lemurs and a dwarf horse. Throughout the day, visitors are also invited to tour The Journey of Faith, the main presentation of the Library, which covers the life and ministry of evangelist Billy Graham. During the month of December, guests to The Journey of Faith can discover a special display entitled “Honoring the Life of Billy Graham: Then and Now,” which examines the legacy of Billy Graham, while also looking forward to how that legacy is continuing through Franklin Graham, Will Graham and the Billy Graham Evangelistic Association today. Admission and parking at the Library is free. Learn more. The Billy Graham Library will be closed to the public Dec. 31-Jan. 6 while regular maintenance is performed and system upgrades are being made. The Library will reopen Jan. 7. The Billy Graham Library opened in 2007 and has since had more than 1.3 million visitors from around the world. Admission to the Library and The Journey of Faith tour is free. For more information on the Library and upcoming events, or to schedule a group tour, please visit BillyGrahamLibrary.org. You can also stay connected with the Billy Graham Library on these social media sites: Facebook, Twitter, Instagram and the Library blog.